They are out there, and they’re deadly. Once you develop a passion. Once you’ve set your sights on your dreams and begin to pursue them, the killer strikes. These killers are not hiding down some dark alley. They are not lurking behind a tree in the park or knocking down the door of your home. In fact, it is quite the opposite. On more occasions than once you’ve probably invited these dream killers over for dinner. And is sad to say that they are probably your friends and family. Most likely they have no goals, they are not ambitious, and want to talk you out of your dreams. You need to create your reality by creating your future. You do this by believing in yourself and working on yourself. Be happy. Believing what others will stop you and cause you to move back if you let it. If you have the proper mindset, and unbeatable mindset, the negativity will do nothing but make you more determined to get to your goals. Who has the right to tell you that you can’t pursue your dreams? People will discourage you. You know those people. No matter how good of a day you are having, they will be there to bring you down. They show up day in and day out to poison your dreams. Remove these toxic people from your life and surround yourself with the people who will encourage and support your dreams. This is not true of the beast of all dream killers. This creature thrives equally in the day as in the night. Whether you know, it’s there or not. This creature never leaves your side, and even with the most effective strategies, you can only exile this creature, because once defeated its power is so great, that if you are not vigilant, it will rise again and be released upon your dream like the Kraken monster of lore. The beast of dream killers has killed more dreams than failure could ever imagine. This beast takes many forms and can show up at any moment to claim the very soul of your dreams. The creature of dream killers is so lethal because it is of no one external to you because it resides within you. This beast has a name, and it is called Self-Doubt. It can be defeated with good habits and perseverance. 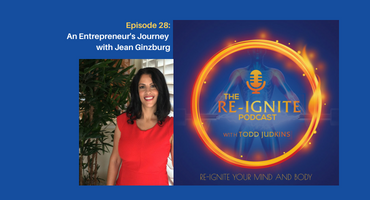 Thank you for listening to this episode of THE RE-IGNITE PODCAST! 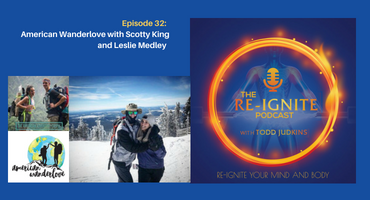 If this podcast resonated with you please subscribe, rate & review, and share it with a friend! 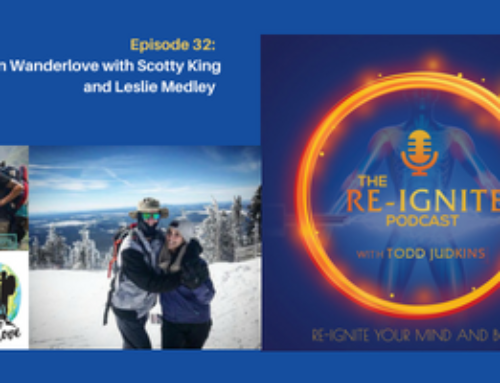 If you liked this episode, please rate and review the show! There are more ways than ever before to stream this podcast!! 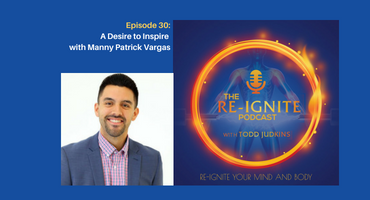 Get even more content on Re-Igniting your life by subscribing to Re-Ignite Nation and never miss the notification to another podcast episode or blog post! Click here to find out how. 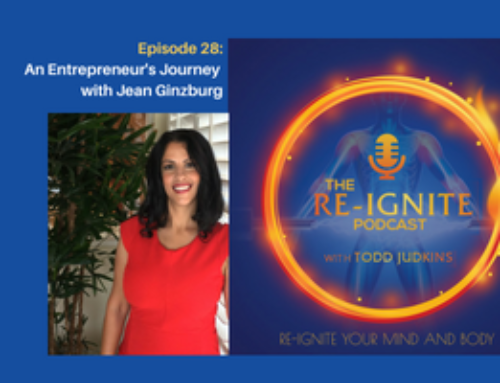 You know mental clarity requires sound nutrition? One of the principals I follow to re-ignite my life is simple and quality nutrition while we are on the go. These are some of the principles taught by our health and wellness advisors. If you’d like to learn more about natural whey or vegetable-based protein, and other supplements to support your health goals whether you want to lose weight, maximize performance, increase energy, focus on healthy aging, sleep support, or simply to live your dash click here to learn more. 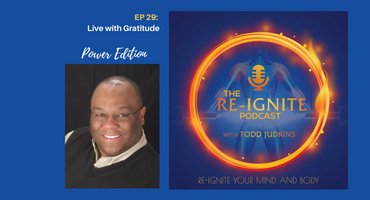 Todd Judkins is known online as The Energy and Sleep Whisperer and creator of his signature program RE-IGNITE Your Mind and Body for Busy Professionals. 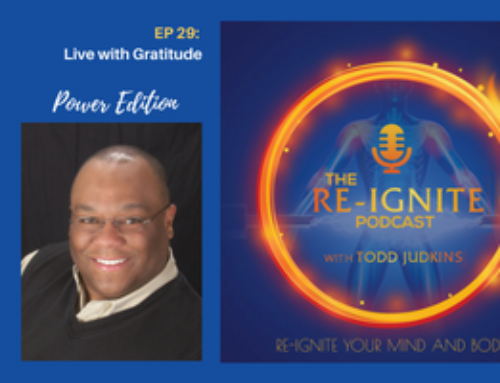 Todd will teach you how to recapture your energy and maximize your performance. You will learn the step-by-step strategies he used to lose a quarter of his body weight, increase both quality and quantity of sleep while turbocharging his energy. 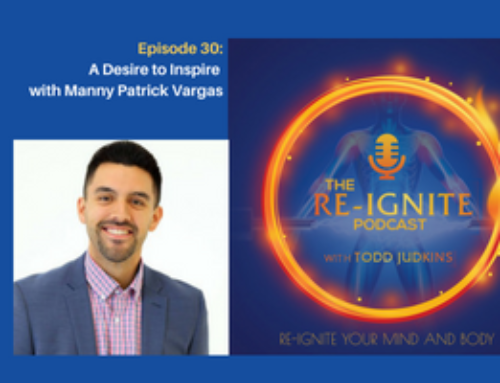 If you are 40+, keep up with Todd if you want to get back in the game and reignite your life.